Formerly known as Upper Volta, (named by the French), her name was changed after gaining independence in 1960 to Burkina Faso. Burkina means “Free Man” in Moore’ and Faso means “Land” in Dyula, so together it means “Country of the Free Man”. The citizens are called Burkinabe, a multi-ethnic nation with at least 60 ethnic groups and as many languages. This land was part of the Great Mossi Empire, the path of several historical migrations, before the whole region was annexed by the French in 1896. This landlocked country is located in the middle of West Africa. It is geographically in the Sahel, the agricultural region between the Sahara Desert and the coastal rain forests. Her high population and limited natural resources result in poor economic prospects for the majority of her citizens. As such, Burkina Faso is listed as one of the poorest nations in the world. She borders Benin, Mali, Niger, Togo, Cote d’Ivoire and Ghana. Unrest in Cote d’Ivoire and Ghana has resulted in thousands of seasonal farm workers unable to find work in neighboring countries. This has taken a real toll, as one of the main exports of this country has been labor. Historically migrant workers from Burkina Faso went to work in the gold mines and plantations of Ghana and the Ivory Coast. The country is however, a large producer of cotton, backed by the Monsanto Corporation and nearly 80 percent of the crop is grown from genetically modified seeds. They also export gold and animal products. The country is mostly rural and the population is highly mobile; a nomadic society. Changing cultivation and trade has made it that way. Most all of the agriculture is for sustenance, leaving only ten percent available for export. The boundaries set up by the colonial powers made little sense as the borders split people of the same ethnic groups, while enclosing people without any affiliations. Despite this, the country enjoys a pretty peaceful society, without any major conflicts. Perhaps it is due to a cultural practice called the “joking relationship”. Members of different tribes and ethnicities, whether strangers or friends, have a tradition that when they happen to meet, they insult each other in a teasing and humorous way. It is absolutely forbidden to take any offense. This approach creates a brotherhood, friendship and respect for one other. French is the official language used in schools, the army and the media, however since most Burkinabe do not attend school, they speak their ethnic languages. Moore’ is what 40 percent of the population speaks, as a high number of citizens are Mossi. In the capital city of Ouagadougou, pronounced “woo-go-doo-go”, only 50 percent of the kids go to school and in the rural areas only 20 percent. Some of the children walk hours each day from their villages to school and then back home again. As one of the poorest nations, they receive quite a bit of aid from other countries and charitable organizations. Vaccine programs have reached even the most remote villages and some medicines are made available for purchase in the village markets. Traditional healing methods are still widely available, using herbs, roots and barks to heal. The country is tolerant concerning religion with 45 percent practicing traditional beliefs, such as animism, 43 percent practice Islam, with the balance being Christians. Each ethnic group has their own beliefs and specialists like earth priests, fortune tellers, healers and rainmakers. Witchcraft and magic are important in everyday life. These practitioners are chosen by tradition or called by a spirit. Sacrifice of chickens, guinea fowl or even bigger livestock is the core ritual of traditional beliefs; these are offered to a wide range of spiritual forces. Many of these ethnic tribes have elaborate celebrations that can last for several days or even weeks to honor the deceased in the afterlife, elevating them to the sphere of their ancestors. A big tourist attraction in Burkina Faso is Lake Tengrela, a small lake that is filled with hippopotamuses, which are sacred according to local legend. Because of this, it is said that they never attack humans. Speaking of tourist attractions there is a place called Loropeni, a UNESCO World Heritage site, which has ruins dating back 1000 years. It is believed to have been a trading post for the gold trade. The site encloses about two and a half acres and there is still much to be uncovered and discovered there. 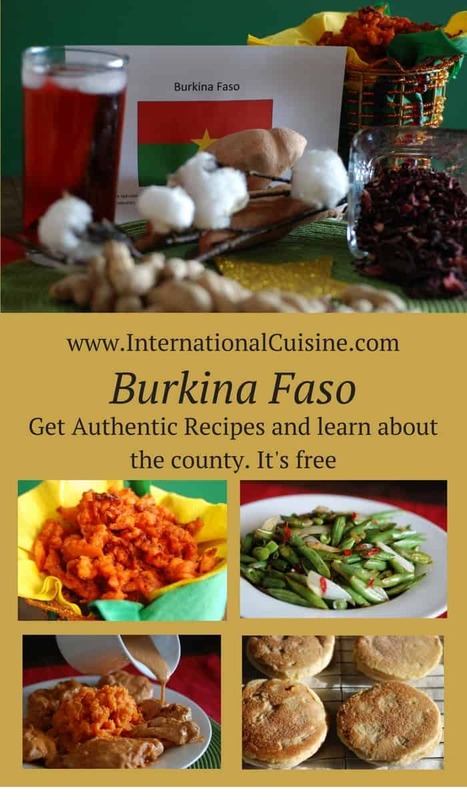 Burkinabe cuisine is similar to many other West African countries and is based on staple foods such as sorghum, millet, rice, maize, peanuts, beans, yams and okra. Tô is the most common food. It is a dough-based meal which is made from millet, sorghum or corn and mixed with a sauce containing vegetables, such as tomatoes, carrots and peppers. On special occasions it is consumed with some type of meat like mutton or goat. In the urban areas, chicken is commonly cooked in the streets and called “poulet-bicyclette” which means, chicken on a bicycle, since that is how they are brought from the villages into town. Many local men drink what is called dolo or chapalo, a home-made millet beer, made mostly by women and sold in local markets. It is said that husbands get a first taste for free but then are expected to pay. 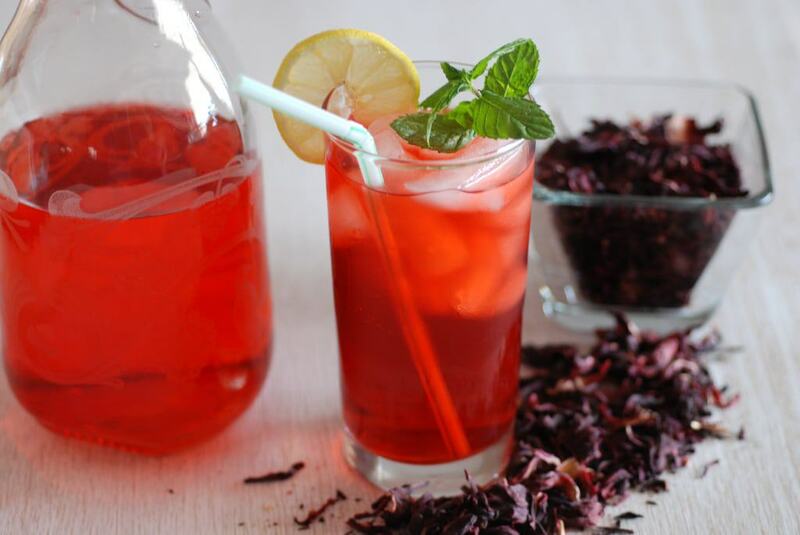 A non-alcoholic drink is called Bissap, a sour tasting drink made from dried hibiscus flowers, is what I chose for our meal. We set the table in red and green with a yellow star representing their flag. We decorated with staple products from their daily life, using yams, peanuts, hibiscus flowers and cotton. Traditionally you would sit on the floor and eat only with your right hand. We began our meal with a simple appetizer of fried yam chips, they were absolutely delicious. We sipped our Bissap during the entire meal and it grew on us with each sip. 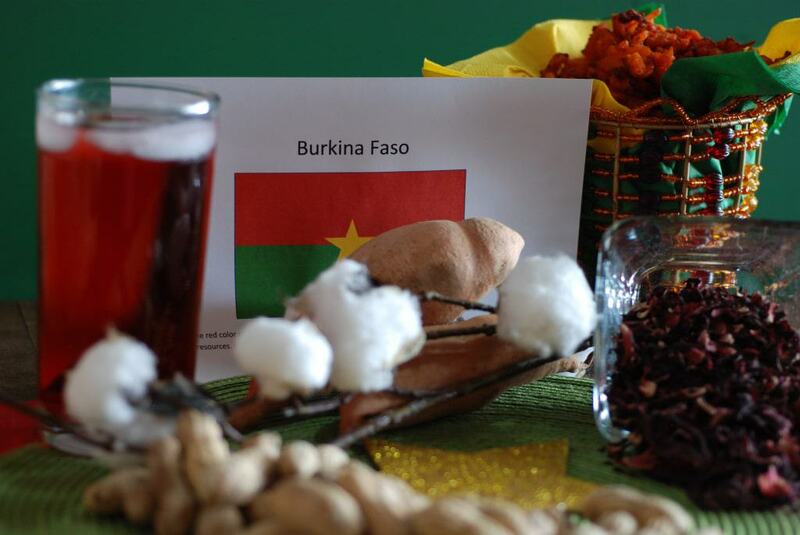 It is a bit sour but leaves you craving more and we could see how it is loved as a perfect thirst quencher on a hot day in Burkina Faso. For the main course we had chicken thighs and mashed sweet potatoes and green beans on the side. 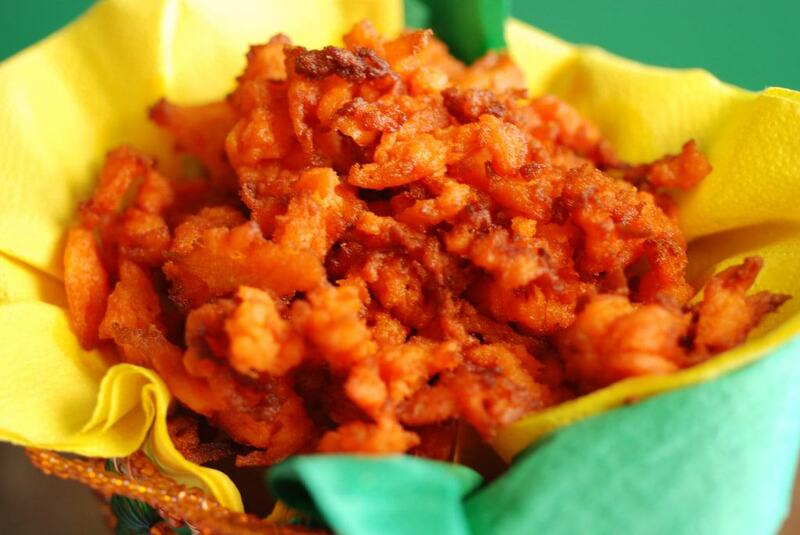 It made me wonder why I don’t mash sweet potatoes or yams more often, simple to make and perfectly delicious. 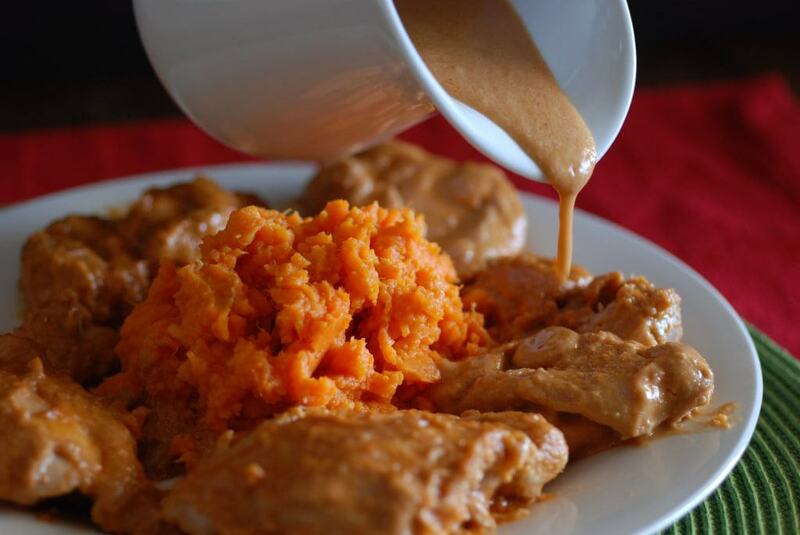 The chicken was cooked in those familiar African flavors of peanut butter, tomato, coconut milk and a small chili, added for a little kick. My husband and I have both been amazed at how much we love these flavors together. At first, what seemed like such an odd combination, has become one of our favorites. This chicken dish is now added to the list! 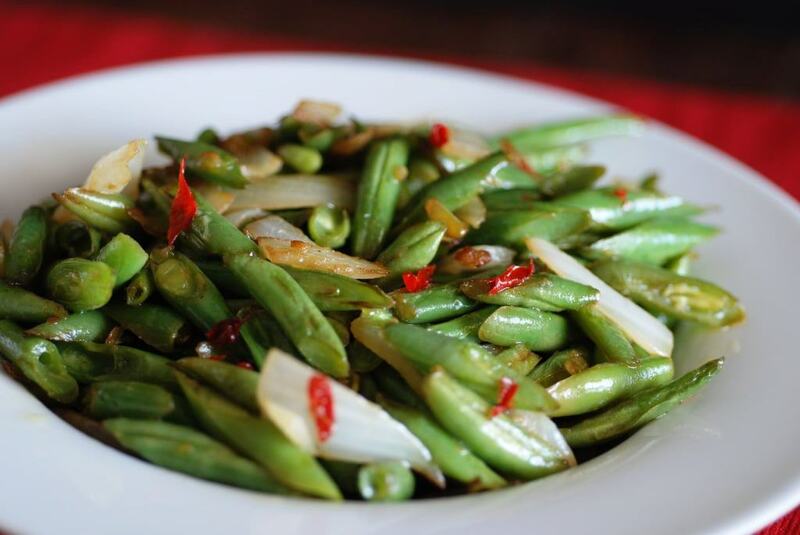 The French green beans were quickly fried al dente’ having a nice, light crunch and seasoned with onion, ginger, garlic and chili. For dessert, we enjoyed Banfora. 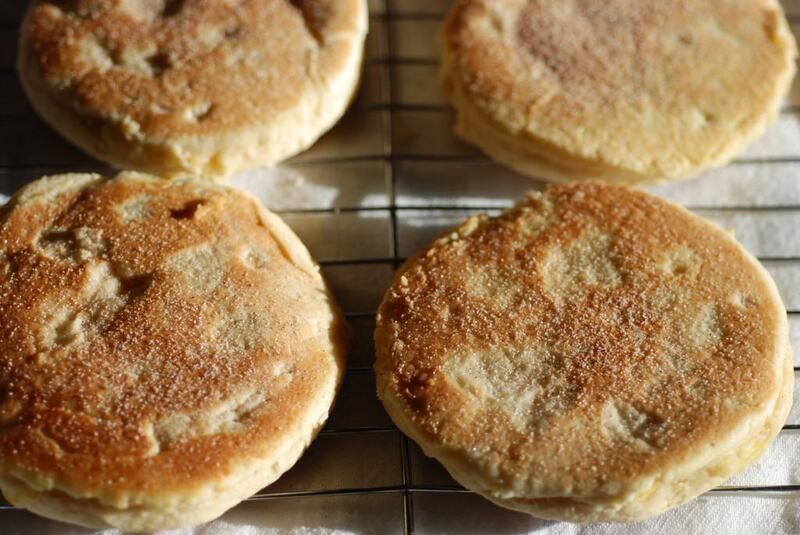 It was like a puffed pancake that was sweet and had bits of pineapple in it; simply divine! I had a couple left over which we enjoyed just as much with coffee the next morning. The Burkinabe people are known to be very friendly with greetings that are ritualized and can seem quite demanding from a traveler’s perspective. They just want to get to know you so they will take your hand and they’ll ask, “How are you? And your family? And your job? And your journey?” And if you ask in kind, perhaps just for a moment, as you share a cup of tea, you will feel, not like a tourist but a friend. And your response: “Laafi Bala, Ya Yamba? I am fine and you? And then you are friends!